Goldfish were the first fish to be raised as pets, and they are by far the best known of all aquarium fish! Many historians believe goldfish were the first fish to be raised as pets from as far back as 800 AD in China. In ancient China, goldfish were considered a symbol of wealth and were kept in ornamental bowls and water ponds. People soon realized that goldfish could recognize their humans and would exhibit social behaviors. Today, goldfish are one of the most popular pets in the world. Goldfish are smart! Goldfish have been shown to have a memory span of up to three months. They can distinguish between various shapes, colors, and sounds. Some have been trained via positive reinforcement to accomplish tricks such as fetching and playing soccer. Goldfish are an excellent choice for an aquarium. They are interesting in their social behaviors, and they come in a great variety of shapes and colors. Goldfish colors range from gorgeous metallic gold and reds to a variety of other shades and sheens. Forms are also quite variable with fancy goldfish that have single or twin tail fins, elongated or rounded bodies, and differently shaped heads and eyes. In a planted aquarium or water pond, goldfish will provide a beautiful and mesmerizing hobby. These hardy, undemanding fish are not too fussy about their food or water conditions. Put them in an aquarium with plant thickets and some rocks, and you have a wonderful display. Simply put, goldfish make great pets! In spite of their good nature and low demands, however, taking care of goldfish requires a bit of work and some common sense. The lifespan of your goldfish and the level of attachment formed between you will depend on the care you provide. Reading up about the type of goldfish you are considering will help you understand both your pet's unique characteristics and how to care for it. Taking care of goldfish is not only fun but will ensure a long, happy life for your pet. The keeping of goldfish dates back to 800 AD. The fancy goldfish we see today are the descendants of a wild carp from Asia (Siberia), the Prussian Carp Carassius gibelio (syn: Carassius auratus gibelio) described by Bloch in 1782. For many years, it was believed that goldfish had originated from the Crucian Carp or Golden Carp Carassius auratus auratus described by Linnaeus in 1758, but recent research points toward the former. Goldfish were originally developed in China and were traded to Japan by the 1500s. They arrived in Europe in the 1600s and made it to America in the 1800s. During these early times, it wasn't easy transporting freshwater fish around the globe. Early aquarists had neither filtration systems nor airplanes, and many fish died en route. Those that did survive were worth considerable money. By the late 1800s, many of the barriers to aquiring and keeping fish as pets started to be resolved. Fish farms were set up and new varieties were once again established. There are estimated to be over 125 varieties of fancy goldfish, but only about 20 types of goldfish are regularly sold in pet stores. Goldfish start out small, usually an inch or two, but they can grow quite large. A size of more than 20 inches is not unusual. Many grow up to 12 inches and can weigh as much as 5 pounds. These are not small fish. They are considered hardy and relatively long living. An average goldfish lifespan is 10 – 15 years, though 20 years is not uncommon. Selective goldfish breeding has produced a wide variety of goldfish available to pet enthusiasts at a reasonable price. If you think of any anatomical fish characteristic, you can count on some variety of goldfish to exhibit it in the extreme. They can have bulging eyes and bodies but fins so delicate that they seem translucent. Originally, the goldfish was the descendent of a rather plain fish, a wild carp, which is primarily a gray or silver color. However, through selective breeding, Chinese fish keepers were able to produce a variety of goldfish colors and body shapes. The red and gold variety was selectively bred. Goldfish colors can also be metallic, flat, or iridescent. The colors of goldfish can change as they age, or goldfish colors can revert to a metallic orange when kept in warmer water. They will also change their coloring based on the spectrum of lighting used. Goldfish produce a pigment in response to light, and their cells will cause a different coloration or reflection based on light. Goldfish are categorized primarily as either single- or double-tailed. Single-tailed types of goldfish usually have long, sleek bodies and a short single tail fin. 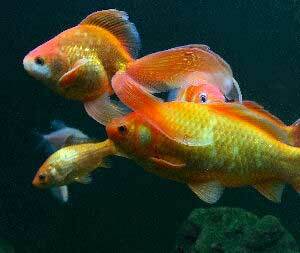 The double-tailed goldfish are usually slower swimmers with rounder bodies and a double tail fin. As you become more confident in keeping goldfish, you may want to try your hand at some of the more exotic-looking or more delicate types. Some readily available and less expensive fancy goldfish for sale include the all-time favorite Black Moor along with the Telescope Goldfish. These two are very hardy, but due to their poor vision need a bit more specialized housing. The Black Moor and the Telescope Goldfish will thrive best housed with each other or with other similarly handicapped goldfish like the less hardy Bubble Eye Goldfish, Lionhead Goldfish, and Celestial Goldfish. Other interesting types of goldfish, though a bit more difficult to find, include Butterfly Tail Moor, Orange Bubble-eye, Bronze Bubble-eye, Hama Nishiki, Chocolate Pom Pom, Panda, and even more exotic species too numerous to mention. The first consideration when getting a goldfish is what to house it in. Once you have determined what aquarium you want for your pet goldfish, you will need some additional basic goldfish supplies. There are several factors to consider when choosing the goldfish tank, filtration, and lighting. Here is one question that always comes up: "Can I keep my goldfish in a bowl, or should I keep it in a tank?" There are a number of good reasons to ultimately opt for goldfish aquariums for the health and long life of your fish. Your goldfish will eventually outgrow a bowl. Goldfish can get quite large, with some reaching up to 20". A goldfish bowl is less convenient to equip with a filtration system to help maintain good water quality, which is critical to the health of your fish. A large surface area is essential for oxygen exchange, and goldfish need lots of oxygen. A goldfish bowl that tapers near the top won't provide the same oxygenation as goldfish aquariums with larger surface areas. Goldfish aquariums are recommended over goldfish bowls. An aquarium is easier to take care of and more economical overall. Given that the standard rule of thumb is 1 inch of fish per gallon of water, it's best to start with a 20 - 30 gallon tank for your first goldfish and then increase the size of the tank by 10 gallons for each additional goldfish. This formula works great when you are first introducing small fish, but it does not work well for large fish. Larger goldfish consume much more oxygen than young fish. Over time, as your fish grows, it will need more oxygenated water than this formula allows. Too little water can actually stunt them and can contribute to disease and even death. To allow for growth, either buy fewer fish than the maximum number of fish (based on the above formula) or be prepared to get a larger tank. Because goldfish do not have stomachs, and they eat a lot, they produce a great deal of waste. Waste leads to rising ammonia levels, which is toxic to goldfish and must be kept to a minimum. Filtration systems remove much of the detritus, excess foods, and waste. This helps keep the tank clean and maintain the general health of the goldfish. Providing good filtration, especially biological filtration, is very helpful in maintaining the water quality of an aquarium. Goldfish are fairly cold hardy, so you don't need light to keep the water warm. However, you may want lighting to show off your goldfish to their best advantage. Aquarium kits and hoods (light fixtures) can come with either fluorescent or incandescent lighting. Choosing fluorescent rather than incandescent lighting will help you save on electricity and give off less heat. Keep the lighting on for about ten hours daily. Goldfish will change their coloring based on the spectrum of lighting used. They produce a pigment in response to light, and their cells will cause a different coloration or reflection based on light. This is similar to the way that humans tan. Removed from light, they will eventually return to their grayish color. There are several types of filtration systems available. See Freshwater Aquarium Basics and Aquarium Setup to learn more about filtration options. When you have decided on a filtration system, all you have to do is set up your tank, select your goldfish, and enjoy! Taking care of goldfish is fairly simple. Provide them with good water quality, a comfortable temperature range, the right goldfish food, and follow a regular maintenance schedule. If there is chlorine is in your water, you will need to add a de-chlorinator each time you add water to the tank. Chlorine will kill your goldfish. You can talk to your local fish store regarding your water, and it can be checked with a chlorine testing kit. If you are unsure, consider adding a de-chlorinator with each water addition. It will not have any ill effects on your tank. The pH for your goldfish aquarium should be maintained between 7.2 and 7.6. You should be able to get a pH testing kit from a local fish store or most pet stores. You can also check with the agricultural department to ensure that your tap water does not contain toxins dangerous to humans or fish. Goldfish are cold water animals so do well in a cooler aquarium. Keep the temperature of the aquarium between 65°- 68° F (18°- 20° C) but not higher than 72° F (22° C). Although goldfish are cold hardy, they do not do well with extreme temperature changes. If you are in a building that becomes quite cold at night, it is recommended that you check the temperature and stabilize it. You may wish to add an aquarium heater, as most models commonly have a built-in thermostat to maintain a relatively constant temperature. Goldfish have done well in water ponds even when the water has frozen over. However, the temperature decreased gradually, and the fish tolerated it. They are cold hardy but don't do well with extreme drops in temperature. If you keep them in a water pond outside, make sure it is more than 30 inches deep. If there is enough oxygen in the water and ice forms on the top, the fish will go to the bottom and become fairly sluggish, nearly hibernating throughout the winter. They should become active again in the spring. Plants help to further add oxygen to the water pond. Goldfish are omnivores and will eat just about anything. Most fish are considered opportunistic eaters in that they will eat most anything and will not stop of their own accord. Goldfish are no exception. Goldfish do differ from most tropical fish, however, in that they do not have a stomach. Because of this, they will produce excessive feces when fed too much. There are a variety of goldfish food products available: pellets, flakes, and even live foods such as brine shrimp. A rule of thumb is feed your goldfish several times a day but not more than they can consume in a 5 minute period of time. If overfed, goldfish will overeat and produce excess feces, which will cause the tank to be dirty and the pH to rise. This is unhealthy for the fish. Goldfish do eat live plants, so choose plants for your aquarium that are goldfish tolerant. You can find goldfish supplies and goldfish food in pet stores or online. For more information, see: goldfish food and aquarium supplies. In properly maintained goldfish aquariums or ponds, goldfish illness is largely preventable. Even so, goldfish illnesses can occur. Goldfish diseases are mostly the same as those that afflict other freshwater fish. Symptoms and treatment of goldfish diseases are also similar. The main types of fish diseases include bacterial infections, fungal infections, parasites, and protozoa. Goldfish are also vulnerable to other ailments caused by injury, poor nutrition, or bad water conditions. If left untreated, goldfish diseases can prove fatal to your pet. But goldfish are hardy, and if treated in a timely manner, most will make a full recovery. When treating for a goldfish illness, it is advisable to move the afflicted fish into a hospital tank. Using a separate aquarium isolates not only the sick fish but also the disease. The tank should have no gravel or plants, and the water will need to be changed regularly. However, if the disease is apparent throughout the main tank, it may be best to do the treatments there. Whether treating a hospital tank or your main tank, read and follow the manufacturer's instructions for any medication. Some medications can adversely affect the water quality by destroying beneficial bacteria. You may also need to remove the carbon from the filtration system, as carbon will absorb many medications making the treatment ineffective. Here is a list of common goldfish diseases, with links for more in-depth information on the Fish Diseases page, where you'll also find symptoms and treatments. Dropsy is a bacterial infection in the kidneys. Fluids build up in the body making the fish bloat and its scales protrude. It generally only affects weakened fish, but can be fatal if not treated quickly. Fish Tuberculosis is indicated by the fish becoming emaciated and developing a hollow belly. Affected fish may also display other symptoms, including lethargy, deformities, lost or frayed fins, lost scales, and more. Tuberculosis may be caused by over-crowding. There is no absolute treatment, and it can be fatal. Though rare, there is a slight risk for humans to contract this disease. Though often caused by bacterial infection, reduced tail or fins can be caused by a number of factors. Other fish fin nipping or bullying or poor tank conditions are often the source, which can cause additional infections that can be either bacterial or fungal. First identify the problem, and then treat accordingly. Fish fungus looks like tufts of gray or whitish cotton-like growths on the skin. It is usually the result of poor water quality and can accompany other types of goldfish diseases. Anchor worms are parasites that burrow into the skin of goldfish, lay eggs, and then die. They leave an ugly hole behind that can become infected. They look like threads coming out of your fish. One type of Black Spot on goldfish is the result of healing wounds, usually from ammonia burns. A rare second type of Black Spot, also known as Black Ich, is a caused by a parasite usually found in ponds and rarely in the aquarium. This infection looks like black specks or smudges on the body of the fish and possibly around the mouth. Fish louse are flattened mite-like crustaceans about 5 mm long that attaches themselves to the body of the goldfish. Fish lice can be a problem for goldfish but are fairly easy to treat, either the individual fish or the whole tank. Flukes are flatworms about 1 mm long, with hooks around their mouth. They infest the gills or body of the fish, much like Ich. But unlike Ich, using a magnifying lens, you can usually see movement and eye spots. Fish will race around the tank, and you may see black or red nodules beneath the skin. Heavy infestation can be fatal, so treat as quickly as possible. Costia is a protozoan disease that causes a cloudiness of the skin. It can be fatal within days. Ich is easy to identify, it looks like your fish is sprinkled with salt. It can be fatal but is easily treated if caught quickly. Chilodonella will cause a blue white cloudiness on the skin. It irritates the fish, causing them to glance off rocks or plants, and they may have clamped fins and difficulty breathing. It is a dangerous protozoan disease but is easy to treat. Eye problems stem from a variety of things: poor nutrition, bad water quality, or rough handling. They can also, result from other ailments, such as bacterial infections. Symptoms of constipation are loss of appetite and swelling of the body. The cause is almost always diet. Swim bladder problems are indicated by fish swimming in abnormal patterns and having difficulty maintaining their balance. This can be caused by a number of things, from constipation or poor nutrition to a physical deformity or a parasitic infection. Feeding frozen peas (defrosted) has been noted to help alleviate the symptoms and correct the problem in some cases. Wounds can become infected, creating ulcers. Wounds can develop either bacterial or fungal infections, or both, and must be treated. There are treatments for each of these diseases individually, and treatments that handle both. Common goldfish are readily available at any pet store that deals in freshwater fish. Most pet stores, and especially fish stores, will also offer a number of fancy goldfish for sale. Some of the more exotic fancy goldfish will be available at fish stores or through special order. You can also find many fancy goldfish for sale on the Internet. Dieter Untergasser, Handbook of Fish Diseases, TFH Publications, 1989.